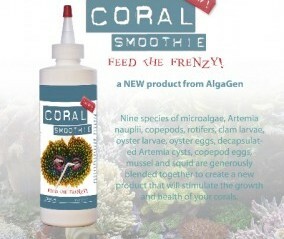 Coral Smoothie is our “kitchen sink” of feeds. It has fish eggs, phytoplankton rotifers, copePODS, copePOD eggs, decap’d brine, squid, fish, clams, oyster and hydrolyzed vegetable protein. It feeds Acans through Zooanthids..and fish too. A customer of ours from New York said his fish wake up from a sleep to feed on this product. He loves it.